WFC (Whatcom Farmers Cooperative) stores officially re-open their garden centers on Saturday, April 9 from 10 a.m. to 2 p.m. Vendors will be on site at each county location to provide information and help with questions. 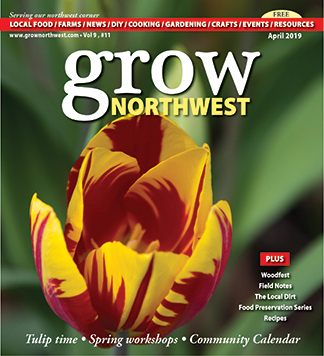 The schedule includes: Bellingham True Value (Meridian), lawn and garden products; Blaine Ace and Fairhaven True Value (organic fertilizers); Fairway (Bellingham Gloves); Ferndale (beekeeping and electric fencing); Lynden (moss control); and Nooksack (wildlife repellents). Refreshments, coupons, and Spin to Win will also be at all stores. For more details, see www.chsnw.com. The Table is officially closing its doors on Saturday, April 16, as owner Katie Hinton announced she will focus on her other company, Bellingham Pasta Company. The restaurant space at 100 N. Commercial St. will be home to new businesses Hundred North, owned by Tim Shea. Hinton will continue to produce her pasta, available at local grocery stores and farmers markets. For more details, see bellinghampasta.com. Avenue Bread opened its doors in the Waples Mercantile Building at 444 Front Street in Lynden last month. Neighboring businesses include the new Village Books store. An open house celebration for Avenue Bread is set for noon to 5 p.m. on Sunday, May 1. The event will be a thank you to the community, and includes a beer garden, complimentary chowder, tours and more. 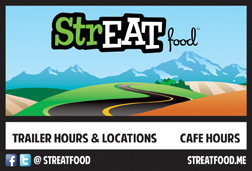 The Lynden location is open Monday through Saturday 7 a.m. to 5 p.m. and Sunday 8 a.m. to 5 p.m. The Whatcom Family Farmers and Whatcom Family Dairy Farmers have been posting some good informational videos through their social media platforms. Twin Brook Creamery and Edaleen Dairy have both been featured. 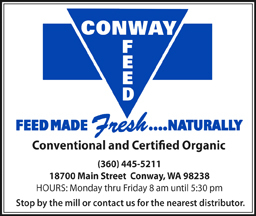 Check it out via their Facebook pages and stay tuned for a future article about dairy digesters in our northwest corner. 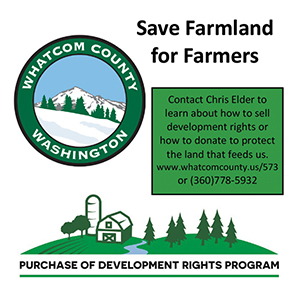 Whatcom Family Farmers was created last year “through the combined efforts of the Ag Water Board representing the six Watershed Improvement Districts, the Whatcom County Dairy Federation and the Whatcom Farm Friends. Its purpose is to be the unified voice of family farmers in Whatcom County and through this effort build understanding and visible community support to help preserve a long term future for farms in our community.” Fred Likkel has been named the new Executive Director of Whatcom Family Farmers (replacing Gerald Baron who served as the initial and temporary executive director). In what’s being called Spring Clean, City of Bellingham residents can drop off tree branches and woody debris for free April 1-8 at Cowden Gravel, 4000 Hannegan Road in Bellingham. Public Works will be set up between 7:30 a.m. and 4 p.m. No dirt, grass clippings or material that cannot go through a chipper for mulch are accepted. Anyone needing additional year-round disposal of yard waste and compost can contact Sanitary Service Company, Green Earth Technology, Recycling & Disposal Services or Nooksack Valley Disposal. Several businesses were named Sustainability Champion Award Winners by Sustainable Connections in March. The following awards were given: Healthy Environment: The Chrysalis Inn & Spa; Lifetime Achievement Award: Marty Jelinsk of Bay City Supply; Meaningful Employment: Scratch and Peck Feeds “you are what your animals eat”; Strong Community: Saturna Capital; and Thinking Local First: Pizza’zza. Alice’s Pies owner Alice Clark announced she will not have her pies at the Bellingham Farmers Market this year. Having accepted the position of Executive Director of the Downtown Bellingham Partnership (DBP), Alice will continue to bake once a week and deliver pies on Friday mornings to the places she is currently serving, including The Book Fare Cafe, Old World Deli, Rock and Rye and Nelson’s Market. For special orders, see alicespies.com. Jello Mold Farm, of Mount Vernon, launched their new website at www.jellomoldfarm.com. Operated by Diane Szukovathy and Dennis Westphall, Jello Mold grows over 80 different kinds of flowers and foliages, and is a founding member of the Seattle Wholesale Growers Market, a farmer-owned cooperative. Mount Baker Distillery, at 105 Fraser St., Suite D2 in Bellingham, launched Mount Baker Gin, its latest product. See mountbakerdistillery.com. The Art of Gardening event, formerly hosted by the Anacortes Farmers Market and City of Anacortes, will not take place this year. The Island Chicks Vintage Market is also taking a year off. A new event, Anacortes Vintage Market Spring Show, will be held April 29-30, presented by Sassy Frass. Organizers say if you loved the Island Chicks show, then you’ll love the Anacortes Vintage Market. Cosmos Bistro at 1151 N. State St in Bellingham is celebrating its first anniversary and will have specials all month-long. The restaurant also added a happy hour from 3-5 p.m. Tuesday through Saturday. My Garden Nursery in Bellingham (in the former Bakerview Nursery space at 929 E. Bakerview) is celebrating their first anniversary. For more details, see www.mygardennursery.com. Appel Farms’ Cheese Shop has been open for two years, celebrating in late March. See their Facebook page or website at www.thecheesefarm.net. Twin Sisters Creamery, in Ferndale, is hosting a tasting class on Thursday, April 7 at 7 p.m. The cost is $30 per person. To sign up, call (360) 656-5240. Ragfinery, the non-profit textile organization, is gearing up for a Spring runway “challenge” and seeks textile artists to participate. The Fancy Pants Runway Challenge tasks participants with transforming one pair of tuxedo pants and one cocktail dress into a single creative wearable item. A $20 registration fee includes one pair of tux pants and one cocktail dress. The Runway Show and judging contest will be held at the Leopold Crystal Ballroom on Friday, May 20, where participants will model their creations. Anyone interested in signing up can do so in person at Ragfinery (1421 N. Forest Street, Bellingham) or visit Ragfinery.com. Deadline for submission of completed works is Friday, May 13. Bellingham’s Fabric-Etc. owner Carol Stewart has announced she is retiring after nearly 19 years in business selling fabric and sewing materials. The “No Foolin’ I’m Retiring Sale” will be held April 1. The store, located at 1663 Birchwood Ave., will close some time in May. The Whitehorse Market in Darrington is opening for the season on Saturday, April 2, now operating in its second year. In addition, the market organizers expect to open 4-Corners Cafe mid summer. Stay tuned to their Facebook page for updates. Bayview Farm & Garden, in Langley, is opening their new Garden Shop, starting with a soft opening on April 1. Follow Facebook or their instagram for Grand Opening Party updates and photos. ACME Farms + Kitchen, based in Bellingham, expanded its weekly service to the Portland, OR area. The company started in 2011 delivering boxes of local, seasonal foods to Whatcom County residents, and later expanded to Seattle. See acmefarmsandkitchen.com. 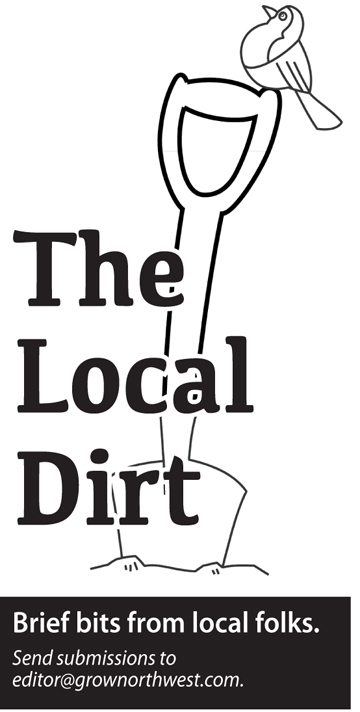 Bellingham Food Bank released a Growing Guide, a product of their Garden Project program. 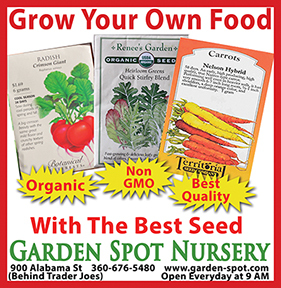 Download it from their website at http://www.bellinghamfoodbank.org/sharing-…/gardening-guide/. The 115-year-old Bush House Inn, in Index, is currently undergoing a complete renovation. For more details, including their historic photo shoot coming up in May, see their Facebook page or bushhouseinn.com. Growing Washington, in Everson, is hiring for full-time and part-time positions this season. Workers enjoy a complimentary weekly CSA box. For more information, see www.growingwashington.org, or contact CSA Farm Manager Kristi Roberts at Kristi@growingwashington.org or (360) 510-4763.